There were activities for children and autism resources for parents at Autism Awareness Day. 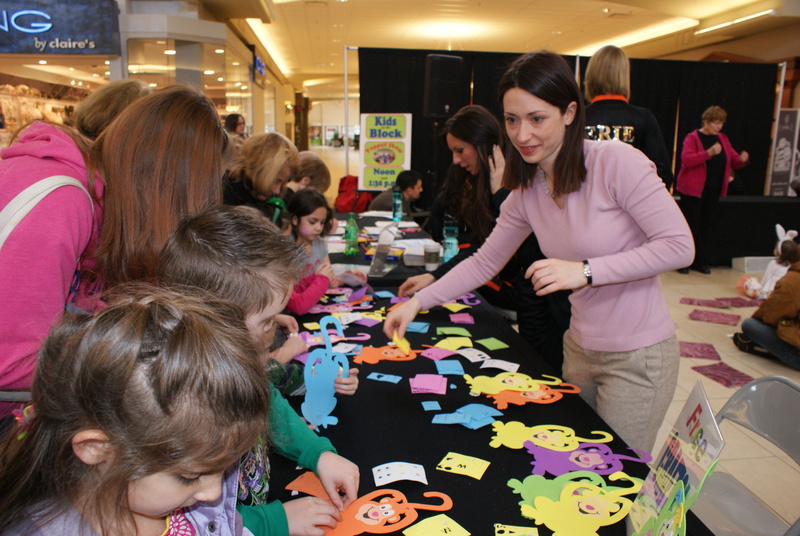 Last Saturday, we hosted an “Autism Awareness Day” at the Millcreek Mall in Erie, PA. I had the opportunity to talk with a number of people who asked questions about some of the latest research findings. The most frequently asked question revolved around the news that 1 in 50 school aged children are affected by autism disorders. This new statistic was the result of a recent government health telephone survey of 100,000 parents with children ages 6-17. While this number will not replace the official estimate of 1 in 88 American children, it indicates that the current estimate may in fact be lower than previously thought. Another point noted in the survey was that many children are not getting a diagnosis until 7 years of age or older, which is a surprise because we stress the importance of early diagnosis. This new information highlights the importance of increasing autism awareness, not only during April but all year long. Another study found higher rates of autism among grandchildren of men who were in their 50’s or older when they became fathers. Researchers used large population samples that allowed them to compare family histories of hundreds of children with autism to those of children with typical development. The increases in autism risk that they documented were small but significant. What is important to note here is that the findings tell us about an increased risk (but not a cause). We will surely hear more about additional risk factors for autism as we continue our work in solving the autism puzzle. Both studies highlight the critical need for a comprehensive federal response to battling autism. Representative Mike Doyle (D-PA) described the CDC report as “an urgent call to action by the federal government to address this growing epidemic. There’s just no avoiding the conclusion that it’s imperative that the federal government dedicate more resources to diagnosing and treating children with autism disorders.” I agree whole-heartedly and am interested in hearing your questions and thoughts on these new findings. This entry was posted in Uncategorized and tagged 1 in 50, 1 in 88, autism, awareness, millcreek mall. Bookmark the permalink.